Lunch special with half sandwich and cup of soup. Ham and Swiss – ham, Swiss cheese, lettuce, tomato, red onion, and mayo. Veggie Brie – avocado, brie cheese, tomato, red onion, and lettuce with tomato balsamic vinaigrette. Cold Mediterranean – hummus, sun dried tomato, feta, bell peppers, lettuce, and tomato balsamic vinaigrette. Chicken Avocado – chicken breast, avocado, lettuce, tomato, onion, and ranch dressing. Smoked Salmon – smoked salmon, cream cheese, capers, tomato, lettuce, and ranch dressing. 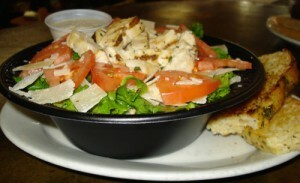 Turkey Brie – warm sliced turkey, soft brie cheese, cranberries, tomatoes, and lettuce. Hot Roast Beef and Blue – hot roast beef, caramelized onions, melted blue cheese and horse radish mayo. Ham and Swiss – sliced ham, melted Swiss cheese, lettuce, tomato, raspberry balsamic vinaigrette – try it on a croissant ! 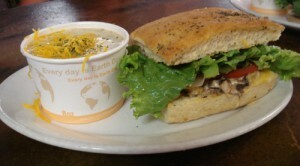 Veggie Melt – sauteed red onions, and mushrooms, with pesto, cheddar and Swiss cheeses, lettuce and tomato. Elk Bratwurst – sliced and roasted with onions, bell peppers, and provolone cheese. Lettuce, tomato, and mayo. Atlantic Salmon – Wild caught fillet baked with tomatoes, parmesan, and pesto. Finished with lettuce. Add Ons …Own your burger! Soup Du Jour – check with us for today’s soups. 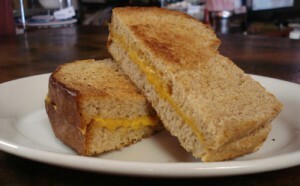 Served with warm bakery bread. Vegetarian Green Chili – cafe made, served with cheddar cheese, fresh cilantro, and a warm tortilla. Fiesta Salad – Spinach (sometime romaine), apple, orange, goat cheese, roasted walnuts, cranberries, and our raspberry balsamic vinaigrette. Greek Chicken – Lettuce, feta cheese, Kalamata olives, bell pepper, red onion, tomatoes, with tomato balsamic vinaigrette. Oriental Salmon – Lettuce, Atlantic Salmon baked with teriyaki glaze, toasted sesame seeds, crispy noodles, pink ginger, cilantro, red onions, cranberries, with Thai curry dressing. Bacon and Blue – Bacon, blue cheese, avocado, tomatoes, red onion, bell pepper, lettuce, with raspberry balsamic vinaigrette.